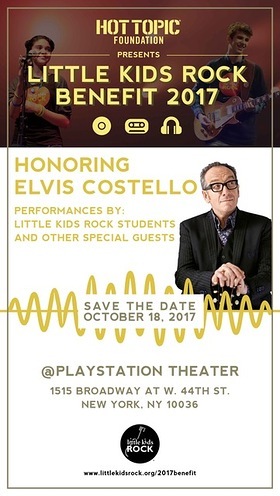 Little Kids Rock will honor Elvis Costello at a special benefit event in New York on October 18. The evening will feature amazing live performances by an array of very special guests including Little Kids Rock students as well as delicious dining, libations, live and silent auction and more. The evening will also honor founder and CEO of City Winery, Michael Dorf, who has spent last 14 years producing tribute concerts at Carnegie Hall, raising over one and a half million dollars for programs that bring music education to deserving youths.